LAWN PARTY IS ON...RAIN OR SHINE! All of our fun will be on schedule Sat. Donate Now to our Direct Donation Appeal!!! 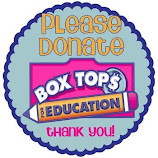 Send in your box tops to benefit our students!